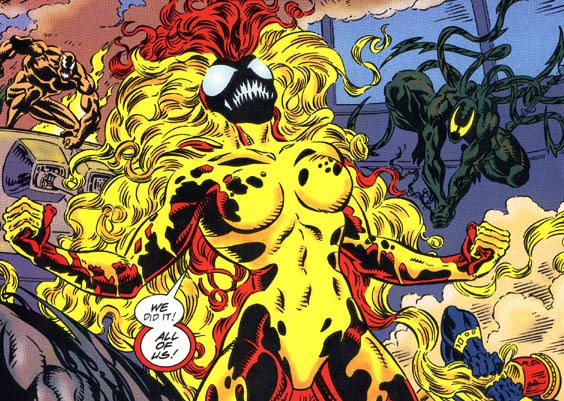 Remember when it was rumored that Venom would be adapting the famous “Five Symbiotes” comic book? Well, it’s looking increasingly likely that Sony and Ruben Fleischer plan to incorporate one or two characters from David Michelinie’s famous arc, after all. How do we know? In light of Venom‘s incredible third trailer (see here), a number of online commentators have noticed a particularly strange yellow substance curling and coiling under the watchful eyes of Dr. Carlton Drake, head of the Life Foundation and the chief antagonist of Fleischer’s franchise-starter. We know of his desire to accelerate human evolution, as Riz Ahmed’s corporate crook is convinced that only a new, superior species is capable of saving Earth from total annihilation – yeah, we’re not sure if that master plan checks out, but we digress. Circling back to Scream, though, and as you’ll see below, it’s nigh on certain that the character will be featured in October’s Spider-Man spinoff in some shape or form. If that’s indeed the case, and Eddie Brock’s growling alter-ego is about to produce a series of spawns, then it could well be that Venom will carve out room for Lasher, Agony and Phage? Chances are Carnage has been earmarked for a cameo (played by Woody Harrelson, perhaps? ), while this morning’s CG-laden trailer revealed Riot to be a monstrous version of Carlton Drake, the man hellbent on creating the perfect fusion between man and symbiote. Whatever the case, Venom is booked in for a release on October 5th – with or without Scream in tow.